According to Birdlife.org.au, the Black-necked Stork is the only stork found in Australia. It has beautiful black and white body plumage and a glossy dark green and purple neck and a massive black bill. With a description like that, it’s easily identified. 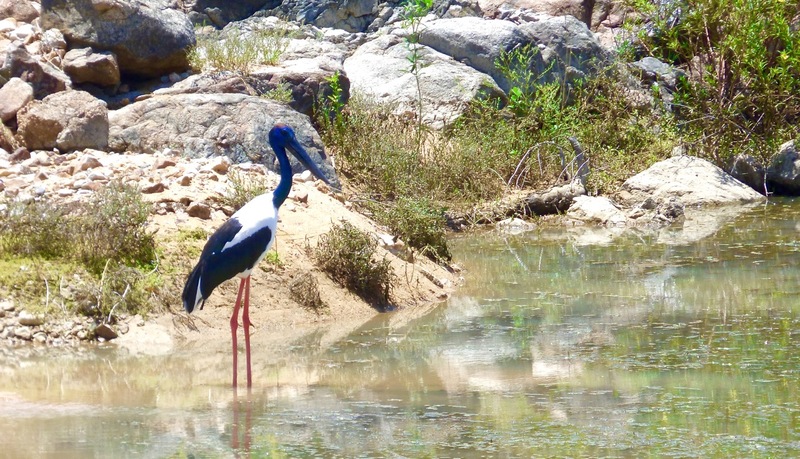 It is also referred to as the Jabiru, though technically, it is not a Jabiru. I saw this black-necked stork as we drove across a spillway on the road to Lake Argyle and as we were the only car on the road at the time, I asked Dean to stop so I could take his photo. Females are distinguished by yellow eyes. This male’s neck and beak were very blue, and very shiny indeed. We were told it is rare to see them at this time of the year, so we feel very privileged indeed. I feel so privileged to get to see such a bird… as I have never seen one before! THANK YOU for stopping and taking the photo! Thank you Nancy, and he was gorgeous to look at. I’m so pleased we didn’t frighten him away.